This is like one of those posters in freshman year dorm rooms with a black and white photo of a little boy holding one bright red balloon. Only the balloon is a killer three-buckle belt. And black and white is brown and white--with pleats. And never you mind that handsome soldier. 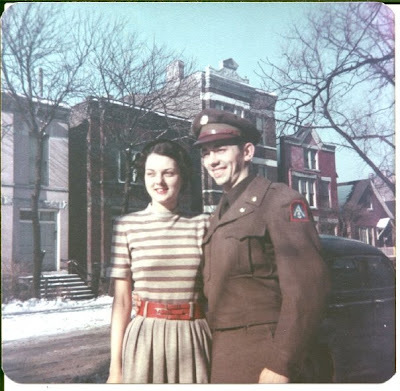 Grandkid Meredith writes:" This is my grandmother Marilyn Jennings Sanders with my Grandfather Tom Sanders in Chicago in 1950. Isn't this outfit awesome? They later divorced so it's really weird seeing them standing together." So sad. I hope she got to keep the belt--at least every other weekend. That's a divorce joke. People who like Cathy comic strips will get it.